I really wanted to wait and review this once the DVD comes out, as thus far it has only been released via the two hour show on Samurai TV! so it is clipped. Once I get the DVD, I will update this review as a show like this you want to see all of, not just a cut up version. But the main two matches will be shown in full so its still worth watching now. While full blown name changes aren’t the norm in Joshi, sometimes after wrestling for a year or two wrestlers want a new identity to show they are growing. A year after she debuted, Mika Iwata must have felt she reached that point as she has officially changed her wrestling name to Mika Shirahime. I would argue she isn’t ready yet, as a wrestler that debuted the same time she did is main eventing the largest Joshi event of the year while she is in the opener, but that is her choice. She is against 19 year old Fujigasaki from JWP, Fujigasaki debuted in 2013 so she has two years experience over Shirahime. They tie-up to start, kicks by Shirahime and she hits a triple jump armdrag out of the corner. More kicks by Shirahime but Fujigasaki avoids a dropkick and hits a hip attack for two. Camel clutch by Fujigasaki, she picks up Shirahime but Shirahime slides away and hits an enzuigiri. Shirahime goes up top and hits a diving body press, but it only gets a two count. Northern Lights Suplex by Shirahime but that gets a two as well, Fujigasaki pushes Shirahime away and dropkicks her in the back. Fujigasaki works over Shirahime on the mat before hitting another hip attack, Fujigasaki goes up top and hits a second rope diving body press for two. Fujigasaki goes up top again and delivers the swivel diving press, picking up the three count! Fujigasaki wins the match. A good bit of this was clipped but it proves my point about the name change – it just doesn’t feel like the right time. Shirahime can’t even beat a young wrestler from another promotion, she is so far down the totem pole she is underground. Which isn’t really a big deal just one year into her career, but it feels like she should have waited to re-invent herself. Anyway this was too clipped to get a feel for, it just established that Mika still has a ways to go. 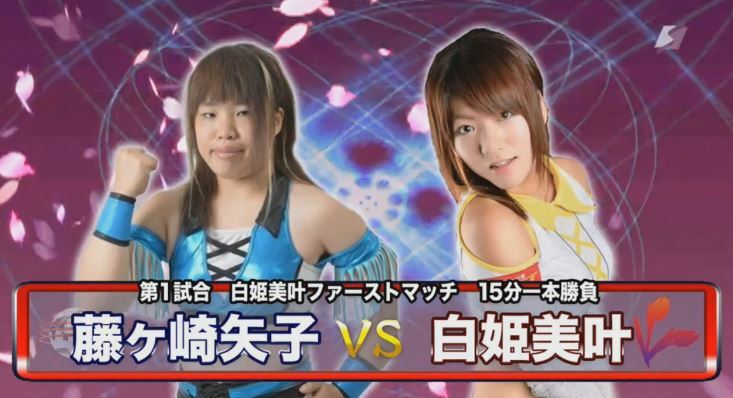 Next up is a Freelancer battle, as none of these wrestlers are from Sendai Girls’. Eiger is a comedy gimmick, something between a zombie and a ghost. Matsumoto and Kansai are two very respected veterans that wrestle in a number of promotions, while Hagane is a young wrestler from JWP. This is just a filler match, and the chance for the crowd to see Kansai since she is retiring soon. We join the match with Eiger and Kansai having a creepy handshake, Hagane comes in but she is not willing to engage with Eiger so Kansai returns. Eiger goes off the ropes and tries to shoulderblock Kansai but has no luck, Eiger gets Kansai’s back and zombie walks behind her, but Kansai isn’t effected by her mind games. Claw Hold by Kansai and she pushes Eiger out of the ring, she returns and Kansai kicks Eiger in the back. Eiger spits dust into Kansai’s face which blinds her, Matsumoto runs in but Eiger accidentally spits dust into her face as well. Matsumoto is blinded and accidentally suplexes Eiger, Kansai then hits a lariat on both of them. Green Fall by Kansai on Eiger, and she picks up the three count! Kansai and Hagane are the winners. About ten minutes of this match wasn’t shown, and pretty much all they did show was Kansai and Eiger’s interactions. This match may have had some ‘real’ action but we wouldn’t know it. Eiger can be amusing gimmick but even for Eiger fans not enough was shown to get excited about. Shirahime is back for another beating. 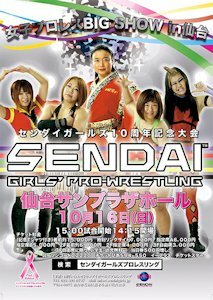 She is the only Sendai Girls’ contracted wrestler in the match, as the other participants are either Freelancers or affiliated elsewhere. Hamada is technically a Freelancer but is one of the top wrestlers in Pro Wrestling WAVE and is also one of the most accomplished wrestlers on the entire card. I am not sure how Momono got on this card, but she is a rookie wrestler out of Marvelous. On the other side, Kyoko and Hana are the deadly mother/daughter duo, while Alex Lee is a Freelancer that appears on 80% of the shows I watch. We join the match in progress with Kyoko toying with Shirahime, hard elbow by Kyoko but Shirahime delivers a dropkick and makes the hot tag to Hamada. Kicks by Hamada to Kyoko, Lee comes in to help but Hamada kicks her as well. Springboard armdrag/headscissors combination by Hamada, double dropkick by Hamada and she elbows Kyoko against the ropes. Hamada charges Kyoko but Kyoko hits a big boot before putting Hamada in a stretch hold. Kyoko tags in Hana as she was begging for the tag, double knee by Hana and she dropkicks Hamada to the mat. Hana goes up top and hits a missile dropkick, cover by Hana but it gets two. Hana goes for a suplex but Hamada blocks it and the two trade elbows. Hamada gets the better of that battle at first but Hana fires back, she goes for a suplex and this time she hits it for two. Sleeper by Hana but Hamada quickly throws her off, Kyoko comes in but she gets double teamed in the corner by Hamada and Momono. Backdrop suplex by Hamada and Shirahime hits a diving bodypress for two. Northern Lights Suplex by Shirahime to Kyoko, but the cover is broken up. Kyoko drops Shirahime to the mat while DDTing Hamada at the same time, Lee comes in but she kicks Kyoko by accident. Hamada comes in but heel kicks Shirahime by mistake, suplex by Kyoko to Shirahime but Shirahime bridges out of the pin. Lee goes up top and hits a diving footstomp onto Shirahime, Kyoko puts Shirahime in a modified camel clutch and Shirahime submits! Lee and Double Kimura win! What does it say about Shirahime that she is tagging with a younger rookie from another promotion but she still is the one that gets pinned? Maybe they are doing the “losing streak to build character” thing with her but a year ago she was being competitive with Kairi Hojo so it seems like a big step down for her. I absolutely love Double Kimura and it is great to see a young wrestler doing so well, Hamada showed Hana a lot of respect and its always nice to see the next generation improve as much as Hana has. Ten minutes was cut so I can’t recommend a match with so much missing, but some solid action here as the better wrestlers controlled the action in what was shown. The last few matches were so clipped that from here on out, everything should be shown close to full. Aja Kong needs no introduction, one of the biggest Joshi legends still active in wrestling and still a force to be reckoned with. She has teamed with Miyagi quite a few times since Miyagi went crazy, Miyagi is a great original personality but is still early enough in her career that it really elevates her to be with Kong. On the other side are two WAVE wrestlers, Mizunami is almost Ace Status while Nagahama is only 20 years old. Each team has a seasoned veteran and a less experienced wrestler, so its an even fight. Miyagi and Nagahama kick things off, Miyagi confuses the youngster with some headbanging before kicking her in the stomach. Nagahama kicks her back and hits a few elbows, dropkick by Nagahama and she hits two more for a two count cover. Miyagi throws down Nagahama by the hair and tags Kong, elbows by Nagahama but they have no impact on Kong, double chop to the chest by Kong and she hits an elbow drop. Kong beats Nagahama for a few minutes as Kong is on too high of a level for Nagahama, she tags Miyagi back in and Miyagi stretches Nagahama in the ropes. Dropkick by Miyagi and she hits a scoop slam for a two count. Nagahama dropkicks Miyagi and makes the hot tag to Mizunami, spear by Mizunami to Miyagi but Kong blocks it when she goes for one on her as well. Mizunami back bodydrops Kong before slamming Miyagi on top of Kong, elbow by Mizunami in the corner to Miyagi which she follows with a lariat. Kong is tagged in, lariat by Kong and she hits a backdrop suplex on Mizunami for two. Kong gets on the second turnbuckle but Nagahama grabs her from the apron, Mizunami recovers and suplexes Kong back into the ring. Spear by Mizunami, she gets on the top turnbuckle and nails the diving leg drop, but Miyagi breaks up the cover. Nagahama kicks Miyagi out of the ring, Mizunami picks up Kong but Kong knees her off. Slap by Kong but Mizunami elbows her and both wrestlers fall to the mat. Nagahama and Miyagi are both tagged in, Miyagi elbows Nagahama into the corner and hits a face crusher. Missile dropkick by Miyagi, she goes back up top but Mizunami hits her from the apron. Nagahama tosses Miyagi off the turnbuckle and hits a dropkick, crossbody by Nagahama and she gets a two count. Miyagi blocks the suplex attempt but Mizunami runs in and lariats her, Northern Lights Suplex by Nagahama but it gets two. Nagahama goes off the ropes but Kong kicks her, scoop slam by Miyagi but Mizunami comes in to help Nagahama. Kong runs in and lariats both of them, Kong picks up Nagahama and slams her in position for Miyagi’s slingshot somersault legdrop. Nagahama comes back with a few flash pins, but Kong breaks it up. Kong hits Mizunami with her paint can while Miyagi picks up Nagahama, but Nagahama slides off and applies the Cassandra for two. Nagahama goes off the ropes but Miyagi boots her in the face, backdrop suplex by Miyagi but Mizunami breaks up the cover. Steel Ball Run by Miyagi, and she picks up the three count! Kong and Miyagi are your winners. After ten months of being vacant, we are finally crowning new Sendai Girls’ Tag Team Champions! I reviewed the event on 9/29/16 that set up this match, as a mini-tournament was held to give everyone a fair chance at winning the belts. DASH Chisako actually held the belts before they were vacated when her sister Sachiko retired, soon after that she started teaming with KAORU and now she can take back a championship she never lost. Shida and Syuri are the Freelancer All-Stars and already have one tag championship in Oz Academy, so they are looking to further assert their tag team dominance. All four wrestlers have their weapon of choice with them, so this match may get a bit crazy. Chisako and KAORU attack before the bell rings, isolating Shida for a double beatdown. Chisako stays in with Shida and hits a dropkick, KAORU returns and Shida is double teamed some more in the ropes. Shida recovers and trades elbows with Chisako, Chisako knocks Shida to her knees and dropkicks her, but Syuri trips Chisako from the floor. Knee lift by Shida and Syuri continues lending a hand, Shida drags Chisako back in the ring and makes the tag to Syuri. Kicks to the chest by Syuri and she kicks Chisako in the back, Syuri applies a cross armbreaker before going for a seated armbar, but Chisako gets into the ropes. Chisako knees Syuri and hits a quick footstomp, she tags in KAORU and KAORU hits a backdrop suplex. KAORU puts Syuri in a surfboard, she lets her go after a moment and applies a crab hold, but Syuri gets in the ropes. Syuri boots KAORU when she charges in and hits a spinning headscissors, kick by Syuri and she tags in Shida. Hip Attack by Shida but KAORU boots her in the face and gets her wooden board, she hits Shida with it a few times before hitting a suplex onto the board. The referee isn’t interested in counting the cover due to the weapon usage, KAORU tries to drop the board onto Shida but Shida rolls out of the way. Shida slams KAORU in front of the corner and gets her kendo stick, she drops it onto KAORU but KAORU catches it. Boot by KAORU, Chisako comes in but Shida puts her in the corner and then suplexes KAORU onto Chisako. Shida tags Syuri, knees by Syuri to KAORU and she hits a jumping knee followed by a double underhook suplex for two. Cross armbreaker by Syuri but KAORU gets a foot on the ropes to get a break. Syuri picks up KAORU but KAORU applies a sleeper, Syuri breaks out of it but KAORU boots her twice in the face. Delayed brainbuster by KAORU, she picks up Syuri but Syuri hits a Backstabber. PK by Syuri, but KAORU bridges out of the pin and rolls up Syuri for two. KAORU tags Chisako, Chisako dropkicks Syuri in the knee and then in the face, KAORU returns and Syuri is double teamed. Chisako picks up Syuri and they trade elbows, jumping knee by Syuri and she hits a German suplex hold for two. Syuri tags Shida, Chisako ducks Shida’s knee so Shida knees her in the back of the head instead. Syuri comes in and they take turns striking Chisako, cover by Shida but KAORU breaks it up. Chisako gets away and throws Shida into Syuri, she goes up top but Shida joins her. KAORU comes in and suplexes Shida from behind, Shida gets tosses her kendo stick and she throws it at Chisako. Shida goes outside the ring and hits Chisako with the kendo stick some more while KAORU and Syuri battle over KAORU’s wooden board. The referee is accidentally knocked out while all four battle at ringside, Chisako and Shida get back in the ring but Syuri joins them as all four have their weapons. The referee recovers and takes Shida’s kendo stick, allowing Chisako to hit a missile dropkick for two. KAORU boots Shida in the corner, dropkick by Chisako and Shida is dropped with a double front suplex. Chisako goes up top and nails the diving footstomp, but Syuri breaks up the cover. Chisako and KAORU go up to opposite corners, but Syuri and Shida avoid both of their dives. Shida hits Chisako with two straight running knees, but she is too hurt to capitalize. They both slowly recover and trade elbows, jumping knee by Shida but Chisako quickly kicks out. Backbreaker by Shida and she nails the Three Count, cover by Shida but it gets two. Falcon Arrow by Shida, Syuri comes in and they hit a double running knee on Chisako. Shida picks up Chisako and hits an enzuigiri, she goes off the ropes but KAORU knees her from the apron. Schoolboy by Chisako, but Syuri breaks it up. Syuri goes for a high kick on Chisako but hits Shida by accident, hurricanrana by Chisako but it gets a two count. Chisako grabs Shida and quickly applies the Spring Round, and she picks up the three count! Chisako and KAORU are the new champions! Before the event took place, we were talking about this match over at DVDVR, so I’ll just repeat what I said there. Chihiro Hashimoto is a Super Rookie for sure, as she already was getting press due to her amateur wrestling background and caught onto wrestling very well, which is why she was getting a title shot. But she had no big wins going into this match, or any wins at all that were against any wrestler that implied she could beat Satomura. Satomura is perhaps the most respected active Joshi wrestler, and she has not lost a singles match since last December. So the cards were definitely stacked against the rookie, as she goes for the biggest title in Sendai Girls’ less than a year after debuting in the promotion. Satomura and Hashimoto quickly go to the mat and jockey for position, but neither can get the clear advantage. Satomura goes for Hashimoto’s arm and applies a keylock, they return to their feet and Satomura hits a snap vertical suplex. Armbar by Satomura and she applies a cross armbreaker, but Hashimoto gets a toe on the ropes to force a break. Kicks to the chest by Hashimoto but Hashimoto picks up Satomura and slams her to the mat. Armtrap Headlock by Hashimoto, she picks up Satomura and drives her back into the corner. Shoulder tackles by Hashimoto but Satomura takes back over and elbows Hashimoto before hitting a backdrop suplex. Headlock by Satomura but Hashimoto reverses it, Cobra Twist by Satomura and she uppercuts Hashimoto against the ropes. Satomura charges Hashimoto but Hashimoto hits a body avalanche followed by a judo throw, she goes for Satomura’s arm but Satomura slides away. Headlock by Satomura but Hashimoto gets a foot on the ropes, uppercuts by Satomura but Hashimoto ducks the heel kick and hits a spear. Hip attacks by Hashimoto and she hits a pair of somersault sentons, but Satomura grabs her and applies a crucifix submission. Hashimoto reaches the ropes to get the break, kicks to the chest by Satomura and she drills Hashimoto in the head, sending the rookie out of the ring. She returns after a moment and elbows Satomura, but Satomura elbows her back and they trade strikes. DDT by Satomura and she goes up top, but Hashimoto rolls out to the apron and joins Satomura. Satomura slides back into the ring and hits a Pele Kick, high kick by Satomura and she kicks Hashimoto some more in the corner. Backdrop suplex by Satomura, but Hashimoto kicks out at two. Satomura picks up Hashimoto but Hashimoto fires off a lariat, Hashimoto gets on the second turnbuckle and hits a somersault senton for a two count. Satomura elbows Hashimoto and applies a sleeper, but Hashimoto quickly gets out of it. Hashimoto goes for a tackle but Satomura blocks it, heel kick by Satomura and both wrestlers are hurt on the mat. Satomura is up first and goes for a kick, but Hashimoto catches it and hits a lariat. Release German suplex by Hashimoto, she picks up Satomura and hits a powerbomb. The referee is particularly concerned with Satomura and stops Hashimoto from doing her next move, Satomura manages to get back up and Hashimoto hits a lariat. Hashimoto picks up Satomura but Satomura delivers a pair of high kicks, Hashimoto comes back with a spear before hitting the Waterwheel Drop for two. Lariats by Hashimoto but Satomura ducks one and hits a Pele Kick. Death Valley Bomb by Satomura, but Hashimoto gets a shoulder up on the cover. Kick to the head by Satomura and she puts Hashimoto in a sleeper, but Hashimoto inches to the ropes to force a break. Cartwheel kneedrop by Satomura, she picks up Hashimoto but Hashimoto blocks the Death Valley Bomb and hits a release German. Satomura jumps to her feet but Hashimoto hits a German Suplex Hold, and Hashimoto gets the three count! Chihiro Hashimoto is the new champion! For better or worse, this was essentially a three match card as the first three matches are too clipped up. Luckily, all three of the matches shown in full (or close to it) were solid, with the tag match being the standout. With Hashimoto winning the title, there are a lot of different directions that the promotion can go in and the next six months will be interesting. It is also nice the promotion now has tag champions again, even if this wasn’t the best event of the year it was certainly newsworthy for Sendai Girls’. Both title matches are worth checking out if nothing else, and as a package the entire event had no bad matches as they were shown. A solid event by Sendai Girls’, maybe not as good as you’d hope for the highest attended Joshi event of the year but entertaining nonetheless.